R1 and R2 are the Phantom resistors and should be at least 1/3W in wattage rating. The input Pad consists of R4, R5, and R6 forming a U-pad once RE2 relay switches to closed position. The Polarity relay RE3 that follows simply reverses the positive and negative sides of the differential input signal. To improve common mode rejection ratio (CMRR) of the differential signal R1 and R2, R4 and R5, R7 and R8, R9 and R10, should be closely matched with a DMM. The absolute values are not as imporant as a relative match between the two resistors in each pair. The Insert header H6 provides facilities to implement a custom insert in between the THAT1570 output and the line driver input. Pin 1 is Vcc (positive supply), pin 2 is Vee (negative supply), pins 3 and 4 are analog ground. Pins 5/6 are positive and 7/8 are negative halves of the differential output. 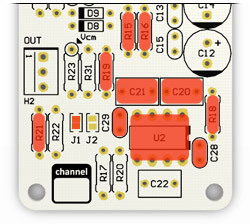 The pinout is silk-screened on the back side of the PCB for referring to after the component side is populated. When not using the header the pins 5/6 and 7/8 should be linked as shown above. 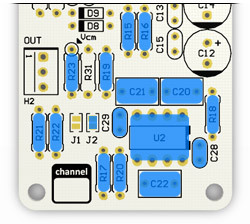 Shown from the back side of the PCB, not component side. The preamp accepts power through the 3.96″-pitch 6-pin header H3. Bypass capacitors C12/C13, C14/C15, C16/C17 are for Vcc (positive rail), Vee (negative rail), and Vdd (digital rail) accordingly. The pinout of the header is silk-screened on the back side of the PCB for referring to after the component side has been populated. Channel #0. Please note R32 in place. U4 quad bus buffer is used to drive TR1, TR2, and TR3 relay driver transistors through R28, R29, and R30 bias resistors accordingly. The transistors, in turn, switch RE1 (Phantom Power), RE2 (Input Pad), and RE3 (Signal Polarity) relays, while D5-D7 diodes are used to suppress inductive kick of (de)energized relay coils. The preamp is connected to a controller through SPI Control header H4 and jumper J5, which is used to select a bank of preamps in groups of 8 for a total of 16 possible channels on a single SPI bus. The jumper must be soldered to either CS1 or CS2 position for the preamp to accept SPI control messages. Solder CS1 position for channels 1 through 8. This is the default position for use with UMPC Front Panel controller. Solder CS2 position for channels 9 through 16. These channel numbers are currently supported by UMPC MIDI Remote only. The output line driver can be configured for either balanced or unbalanced operation via jumpers J1 and J2, as well as omitting certain components around the output opamp. For balanced operation solder all of the components in, solder J2, and leave J1 open. For unbalanced operation leave J2 open, solder J1, and leave out R17, R20, R22, R23, C22.